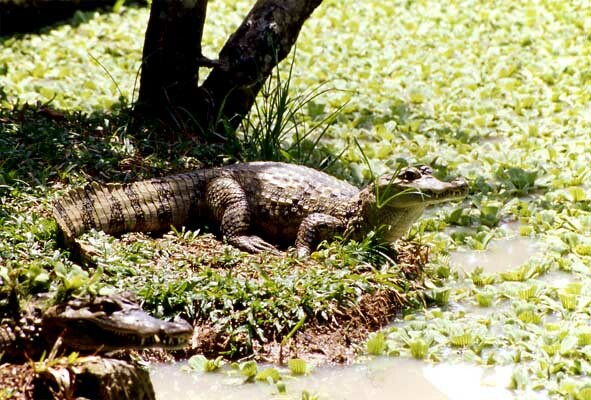 The Spectacled Caiman (Caiman crocodilus) is the commonest species of Amazon caimans. It's often seen during night excursions along a quiet river. You look for them by shining a flashlight along the water's edge, and then spotting the animal's eye which reflects bright red. The name of this species comes from the bony ridges across the snout. Unfortunately caiman are heavily hunted primarily for their skins (see hunting - skins), and are becoming rare near human settlements. This individual is basking beside a water-lettuce covered pond. As with all reptiles, caimans rely on the sun to get enough body heat to remain active. When it wants to cool down, it can move into the shade of the tree or slither into the water. 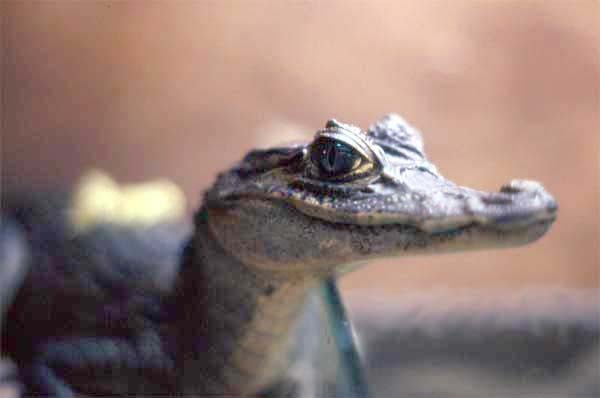 This picture shows a young Spectacled Caiman, only a few months old. Individuals this small are vulnerable to predators, notably herons and large fish. The tables will be turned by the time it has matured, reaching the adult size of six or seven feet.